Jews arrived in the Twin Cities and other regions of Minnesota as a result of immigration from German lands and Eastern Europe from the mid-nineteenth century to the closing of Eastern European immigration in the 1920s. By 1910, the Twin Cities Jewish population had doubled to 13,000 people, reaching a peak of 44,000 people in 1939. The “tribal twenties” were marked by racism, antisemitism, and anti-Catholicism. The Depression era of the 1930s further magnified discrimination. During that difficult decade, virulent antisemitism was advanced by the Ku Klux Klan, beginning in the 1920s, and the Silver Shirts, a popular fascist organization with a strong following in Minnesota. Jews, particularly in Minneapolis, were shut out of civic life and social organizations. Discrimination in employment and housing was legal and accepted. Jews in the Twin Cities were restricted from buying homes and property in many parts of the cities, and few northern Minnesota resorts welcomed them. In this period, the majority of Jews worked in blue collar jobs. There were, however, Jewish professionals—doctors and lawyers—and they were excluded from law firms and hospitals. Their exclusion led to opening law firms where Jews could practice, and to building Mount Sinai hospital in 1951, a non-sectarian, private hospital. Deep bonds of association were a part of Jewish life historically, and intensified in the face of virulent antisemitism. Synagogues, educational institutions, philanthropic and social organizations, and the Minnesota Jewish Council (now the Jewish Community Relations Council), a defense organization, as well as Zionist groups, were all part of Jewish life in the Twin Cities and in other areas of the state throughout the interwar period and beyond it. Minnesota Jews were very active in political life in this period, often associated with Farmer-Labor and ultimately the Democratic Farmer-Labor party. Hyman Berman and Linda Mack Schloff. Jews in Minnesota. Minneapolis: Minnesota Historical Society Press, pp12-52. As discrimination was outlawed beginning in the 1940s, opportunities for Jews increased and antisemitism slowly—but never entirely—disappeared, until its resurgence as a result of the rise of white nationalism and neo-Nazism in the first decades of the 21st century. During the 1930s, Jewish students had been attending the University for many decades. They came from the Twin Cities, from the smaller towns and cities of Minnesota, and from out-of-state as well. Because of pervasive antisemitism, Jews were viewed as different from other white students for many reasons. They were not Christian; many of them were urban, and many supported left-wing causes, particularly in the 1930s. Many Jews from the northeast were active in the labor movement, in the fight for racial integration, and human rights. They were the objects of antisemitic stereotypes that viewed Jews as misers, unscrupulous in business, and immoral. 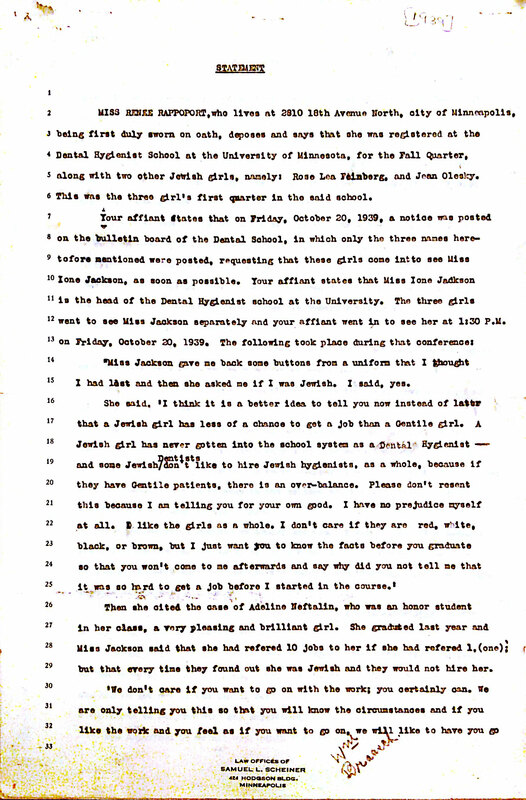 Jewish students were treated by University of Minnesota administrators and many of their peers as “different,” “inferior,” or even “dangerous.” Nevertheless, Jewish students were admitted to most of the University’s colleges, including its professional schools, where there were rigid quotas to keep their numbers to a minimum, and medical internships were sometimes made “proportional” to the number of Jews in the state. The nation’s quota system that began in the late 1910s dramatically limited the number of Jewish students who could attend private colleges and many professional schools. The undergraduate world of the University of Minnesota was built on social fraternities, sororities, and many interest groups that were rigidly separated by religion, race, and gender. The Minnesota Daily, honor societies, clubs, and political organization did include Jews, but only a few African Americans. In this world of parallel organizations, minority students often found a sense of security and community by establishing their own separate groups, not the least because they were barred from all others. 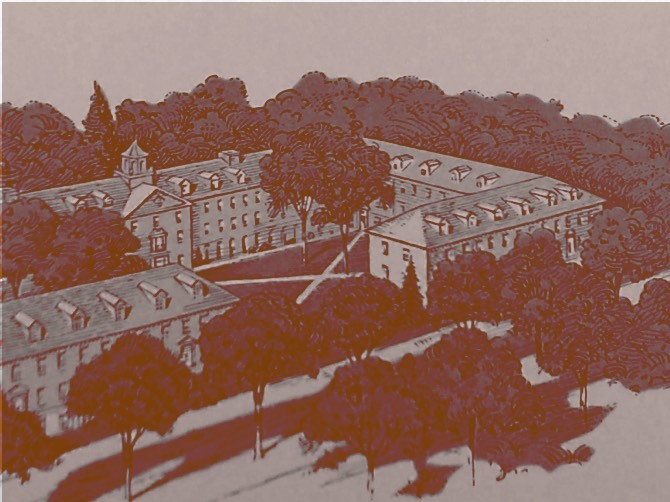 The Menorah Society, founded for faculty and students in 1903, and then Hillel, founded in 1923, were both national movements to enable Jewish students to connect with one another. The University of Minnesota had Jewish and African American social fraternities and sororities because both groups were barred from entering the Greek system. Jews also created their own pre-professional organizations for the same reason. The University had chapters of a Jewish engineering fraternity, Sigma Alpha Sigma; dentistry, Alpha Omega; medicine, Phi Delta Epsilon; and pharmacy, Alpha Beta Phi. Hillel House was the one site on campus for Jewish students from in and out of state to gather. 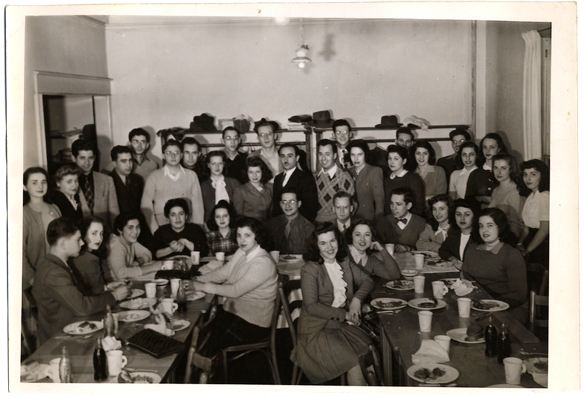 Photograph of students at Hillel House, 1946. Members of the Jewish communities of the Twin Cities contributed to purchasing this house to have a place for Jewish students from in and out of state to gather. This parallel structure reflected the larger society in which Jews and African Americans created their own philanthropic, religious, professional, and social organizations that were rarely integrated with the majority culture. But separation also limited opportunities and access to all of University life. At the University, Jews were treated like “white” students in many parts of campus life. But they were categorized as “different” for others. When students, parents, or members of the Jewish community complained about their exclusion to administrators, their concerns were explained away as the fault of employers, householders who ran boarding houses, or students’ intolerance. Jewish students, like African American students, were called to task for having the wrong expectations. Because many of them embraced the same prejudices toward Jews, University administrators rarely took a stand or used their leverage to change policies related to Jewish or African American students until well into the 1950s. One of the most disturbing expressions of campus antisemitism in this era is visible in a correspondence between the directors of the University of Minnesota’s Student Union and Cornell University’s Union. It was found in Coffman Union around 2000, hidden behind a folder marked “X” in a long-forgotten file. When the newly built Student Union’s director, G. R. Higgins, wrote to Cornell’s director Foster Coffin to complain about the “Jewish use of the building,” he remarked that “their person is diluted with a tremendous amount of non-Jewish students.” Jews were rendered as alien and repulsive. They were racialized by reference to blood (diluted). The director could not find them “committing a specific sin,” but felt burdened by their presence. This exchange took place in 1941 when a Nazi ideology focused on racial genocide against Jews was firmly in place. The language of the letter is disturbingly close to that of the Nazis. This folder was found in Coffman Union sixty years after it was used. It includes an antisemitic letter exchange between heads of student unions. 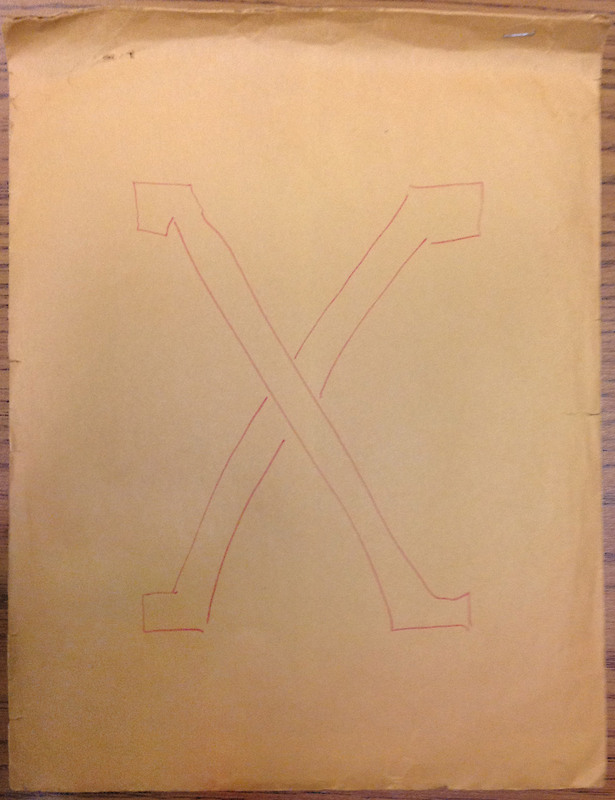 This folder was found in Coffman Union sixty years after it was used. It includes an antisemitic letter exchange between heads of student unions, and statistics tracking enrollments of Jewish and African American students labeled confidential. This letter is from an antisemitic correspondence between the Director of Cornell University’s Willard Straight Hall student union, and the Director of the Minnesota Union (subsequently called Coffman Union). 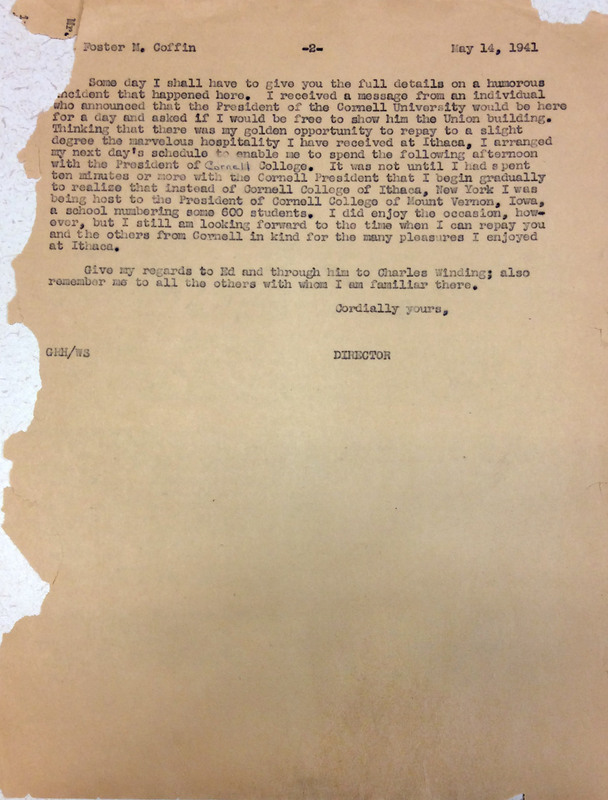 This letter is from a correspondence between Foster W. Coffin, Director of Cornell University’s Willard Straight Hall student union, and G.R. Higgins, Director of the Minnesota Union (subsequently called Coffman Union). 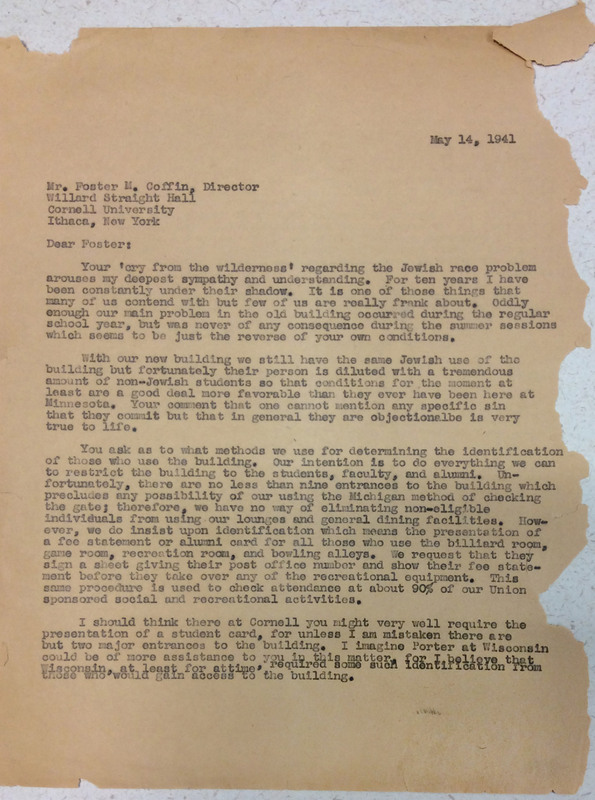 Coffin wrote to Higgins about the “problem”of “Jewish girls and boys using the student union.” Higgins’ reply thanks Coffin for his “cry from the wilderness.” He responds, using racist and antisemitic language, that Jewish student presence is “diluted” by the presence of non Jewish students. This remarkable choice of words in 1941 echoes the language of the Final Solution in Nazi Germany and segregation in the South. From the 1920s to the 1950s, boarding houses offered rooms and meals to students throughout Minneapolis neighborhoods. Until well into the 1950s, “householders” who ran these homes had the right to reject Jewish, African American, and also foreign students. The University, only under pressure from student members of the NAACP, stopped giving householders “preference cards,” which allowed them to refuse boarders on the basis of race, religion, or nationality. In 1923, the daughters of Phil Calmenson, of Montevideo, were excluded from a boarding house near campus because, they were told, they were “of Jewish descent.” Mr. Calmenson felt the need to turn to the local School Superintendent, Mr.J.J. Bohlander, for help in addressing the problem. He appeared to believe he could not be effective if he contacted the University himself. Superintendent Bohlander wrote to the University’s Registrar to inquire about the Calmenson sisters being asked to leave a boarding house because they were Jewish. 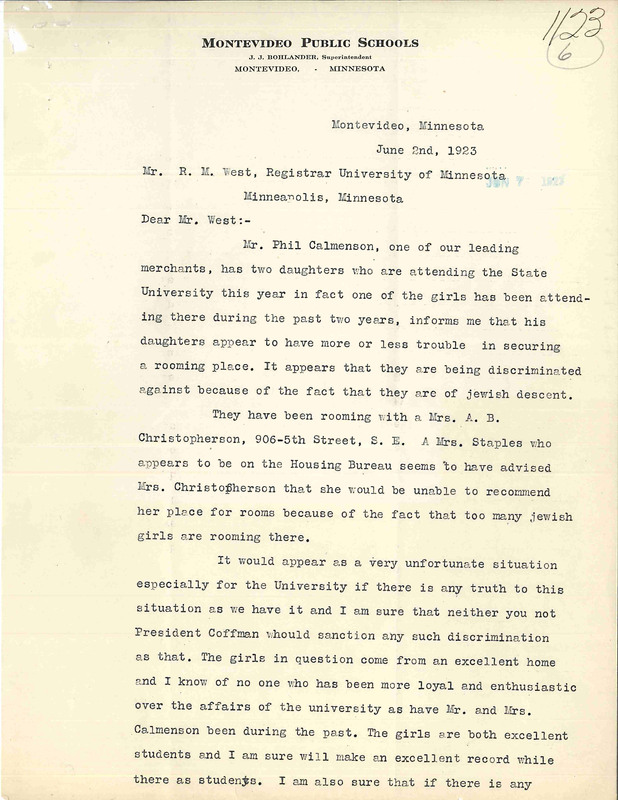 Superintendent J.J. Bohlander wrote on behalf of the Calmenson family to the registrar Mr. West asking why the Calmensons were told that having Jews in a boarding house lowered its ranking at the University, after the two sisters were asked not to return the following year. Superintendent Bohlander’s letter not only recounted the events that happened, it underlined his belief that the University of Minnesota would treat all people fairly. It also provides evidence that the University ranked its boarding houses on the basis of the religion of its residents with a lower ranking created by housing young Jewish women. 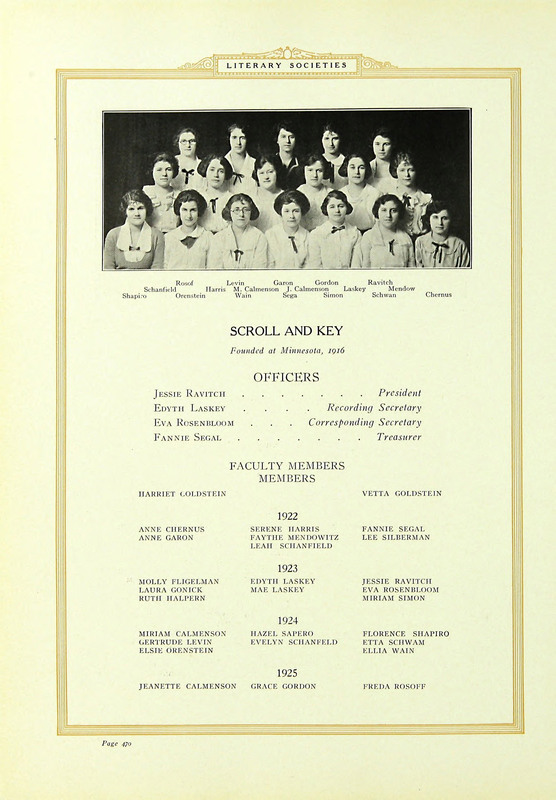 Jeanette and Miriam Calmenson were both members of the Scroll and Key Literary Society in 1923. They were asked not to return to their boarding house by Mrs. Christopherson because they were Jewish. Jews had limited work opportunities in Minnesota because employers had the right by law to exclude applicants on the basis of race, religion, and gender. The University made no effort to challenge racism and antisemitism, and instead warned students to give up their studies. That was the case with three young women who were asked in 1939 by Iona Jackson, head of the Dental Hygiene Program in the Dental School, to leave the program to which they had been admitted. She invited Renee Rappaport, Rose Olesky, and Rosa Lee Feinberg to withdraw after a month in classes on the basis that no dentist would hire a Jewish hygienist. Renee Rappaport gave a statement at a deposition to an attorney, Samuel Scehiner, about what transpired. 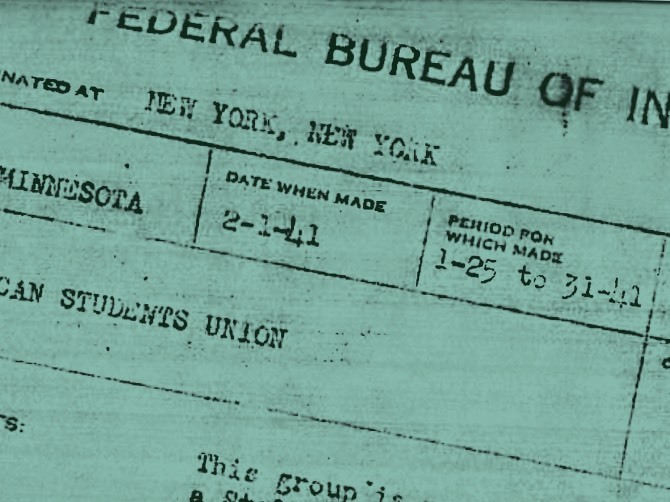 The newly formed Minnesota Jewish Council (later the Jewish Community Relations Council), which emerged in 1938 to combat antisemitism in Minnesota, addressed the problem and contacted the University. Scheiner led the MJC and JCRC. 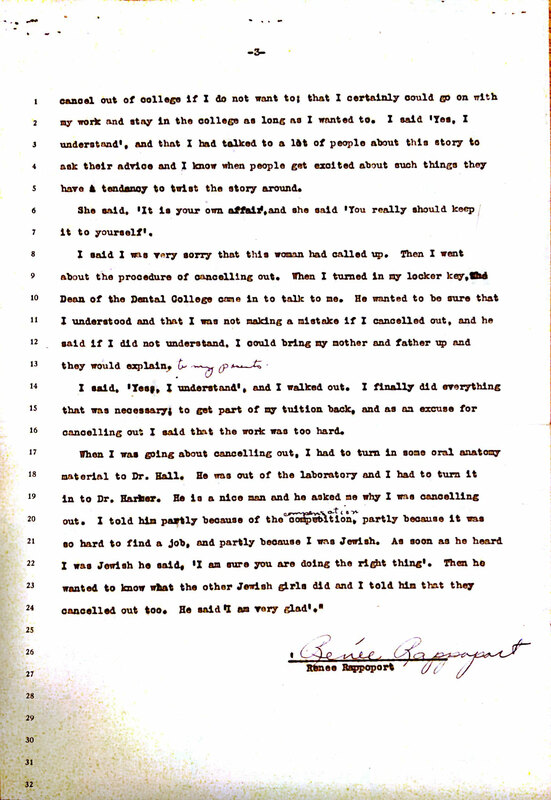 In her statement, Rappaport reported that she was asked if she was Jewish. Then she was told no Jewish girl had been hired in the school system as a dental hygienist, and even Jewish dentists would not hire one, because of a fear of “over balance” with gentile patients. 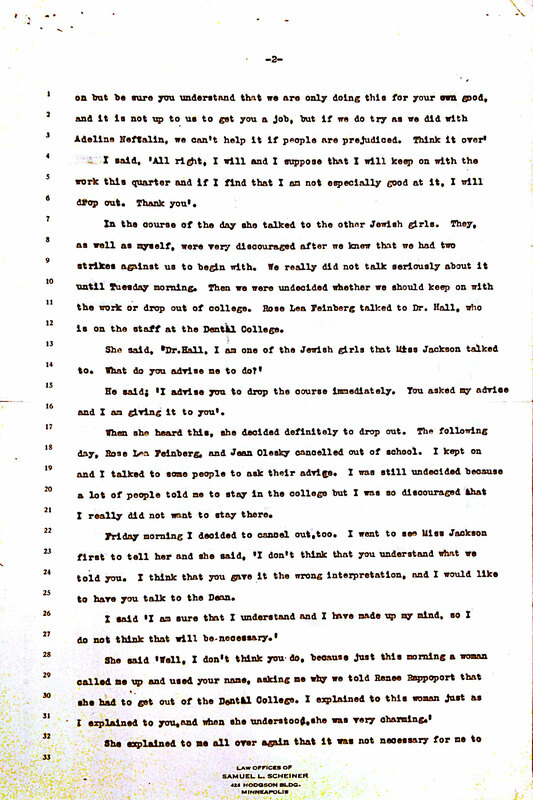 In this detailed document, Renee Rappaport noted that Iona Jackson emphasized the fact that there was nothing she could do about the fact that Jewish women would not be employed. All three young women did drop out of the program after only a few weeks. Renee Rappaport’s tuition was refunded, but she was required to report that “the work was too hard.” She was not allowed to state that she had been counseled to leave because a Jewish woman would not be employed in this field. In the fall of 1935, the University of Minnesota welcomed the Nazi Ambassador to the United States, Hans Luther. Adolf Hitler came to power in Germany in the 1930 election in the midst of economic depression. A politically chaotic time followed with competition for the chancellorship, which Hitler assumed in 1932, and the dissolution of the Reichstag, the democratically elected national assembly. The Nazi platform was based on unifying a German nation that was racially pure. Jews were its enemies. Just a few months prior to Ambassador Luther’s November visit, the Congress of the United States had declared that the nation would remain “neutral” in any war. Long-standing allies England and France were facing fascist nations, which included Germany, Italy, and Spain. American neutrality meant that fascism could grow unhindered. Few Americans, following WWI, wanted to engage in war again. Many Americans supported Adolf Hitler and Nazi policies of racial hierarchy and anti-communism. Hans Luther was appointed Ambassador to Washington in 1933. In all of his public statements and speeches he insisted that there was no religious discrimination in Nazi Germany, no persecution of dissidents, and “internal matters” in Germany should be of no concern to others. The University of Minnesota genially hosted Ambassador Luther on November 19, 1935 as part of his tour of midwestern cities and universities intended to counter a national campaign to boycott the Berlin Olympics scheduled for the summer of 1936. Many Americans questioned if participation in the Olympics would sanction Nazi policies, particularly around race and religion and the Third Reich’s treatment of political dissidents. Luther went to the midwest because of the strong German heritage of its citizens. He expected sympathetic treatment on campus and in community organizations. His first stop in Madison, Wisconsin proved that he had misjudged the popularity of Nazism. In September, 1935, just months before Hans Luther’s campus visit, the newly constituted Nazi Reichstag passed the Nuremberg Laws, which stripped all German Jews of their citizenship and outlawed marriage and sexual relationships between Jews and Christians in order to create a “racially pure” Germany. Who Welcomed Hans Luther and Who Protested? The University of Minnesota was one of the least hostile venues where Hans Luther spoke. He was the guest of the Twin Cities’ Civic and Commerce Club, though some of its members objected to his visit, and the German Language Clubs. The University’s German Department hosted the Ambassador for a tea in Shevlin Hall. Rather than greeting Luther with mass demonstrations, fifty students went to Shevlin with the intention of asking questions about Nazi policies. Luther refused to answer questions from the press or from the students. Dean of Women Anne Blitz held students at bay, refusing to let them join the event, and called campus police to eject a student who would not leave. The Minnesota Daily provided a detailed account of what occurred at Shevlin Hall, where a German Department tea for Nazi Hans Luther occurred. 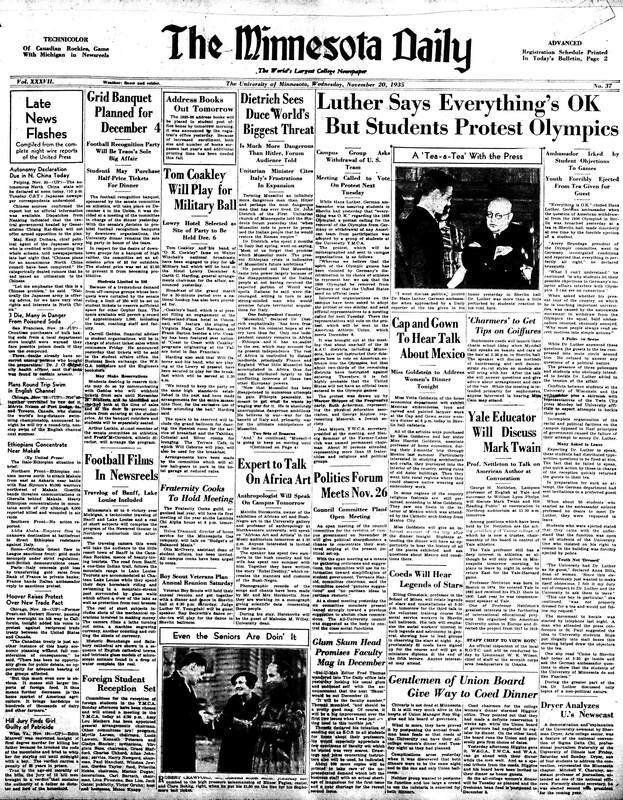 Hans Luther, the “stout, bald ambassador” from Nazi Germany, responds to the call for an Olympic boycott and the student demonstrations against his visit to the University of Minnesota. Many students were forced to leave Shevlin Hall, where the German Department hosted him at a tea. The article labeled the demonstrators as “hecklers” rather than protestors. Dean Anne Blitz was concerned that a student protester was not properly dressed for a tea and stopped them from asking Luther questions. A concurrent meeting organized by the University YMCA, YWCA, and Menorah Society drafted a joint statement protesting Germany’s racial discrimination against minority athletes. Seventy Catholic and Jewish organizations were joined by labor and political groups who organized demonstrations wherever Hans Luther spoke. Hans Luther’s visit to Minnesota in 1935 quickly became a political lightning rod. 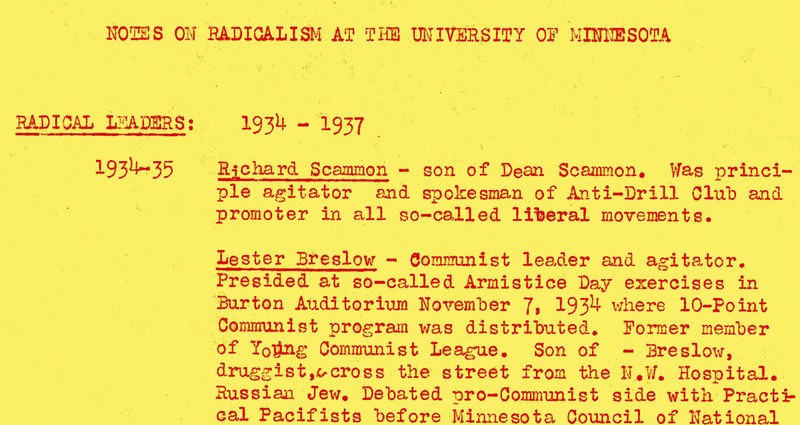 The arrival of the Nazi ambassador in Minneapolis prompted students and community leaders to protest events planned at the University of Minnesota and local organizations, notably his address to the Civic and Commerce Association. Members of the press drilled Luther on the tenets of Nazi ideology and their offense to American values, and university groups made public resolutions to boycott the 1936 Berlin Olympics in protest of German discrimination. 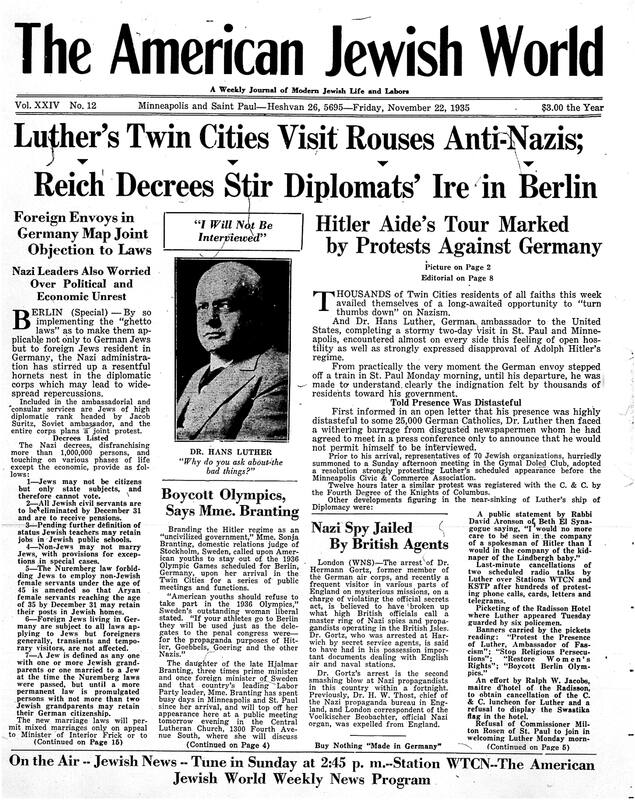 The American Jewish World, the local Jewish community newspaper, reported extensively on Luther’s visit to the Twin Cities in the November 22, 1935 issue. Rabbi David Aronson of Beth El Synagogue in Minneapolis wrote an editorial challenging Luther’s oft-repeated statement that Nazi persecutions of Jews could be treated as an internal matter. 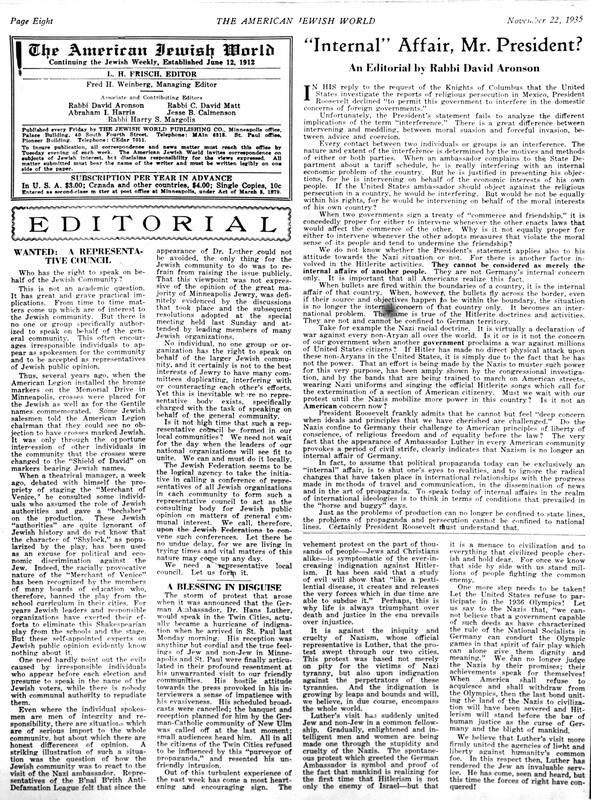 Aronson wrote this editorial in response to a 1935 statement made by President Roosevelt on the subject of international affairs. Even in cases of religious discrimination, Roosevelt declined to “interfere in the domestic concerns of foreign governments,” but Rabbi Aronson argued that engagement with the persecutional policies and propaganda of other nations was unavoidable. The anti-Semitism of Nazi Germany was, in effect, a declaration of war against millions of United States citizens, and the presence of Hitlerite representatives like Hans Luther in American communities made the issue an unambiguously domestic affair. 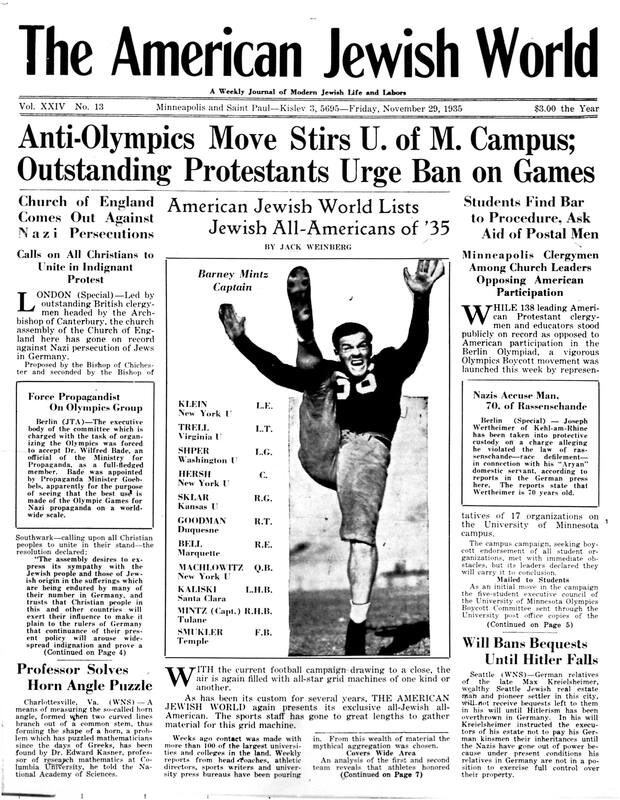 Many students saw a strong connection between Nazi policies and the need for the United States to boycott the 1936 Olympics, which was an international movement with strong support initially in the United States. The University YMCA hosted a gathering of thirty students representing fifteen campus religious and political organizations and fraternities. They approved a petition calling for a boycott and intended to put it to a student vote. The boycott group prepared a letter to all students to invite them to vote for or against the petition to boycott the Berlin Olympics. Their mail was refused by the University’s postmaster. 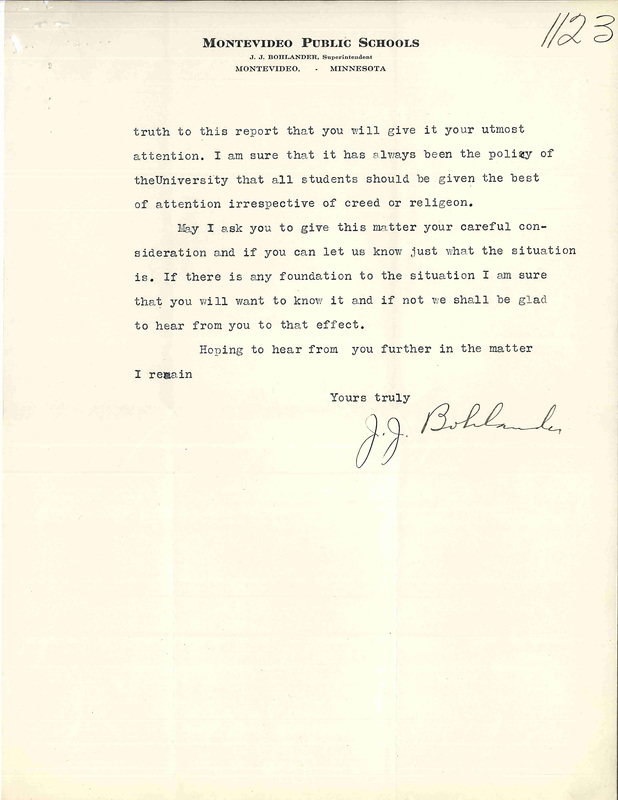 Dean of Student Affairs Edward E. Nicholson supported the decision and interfered in students’ rights to condemn Nazism. 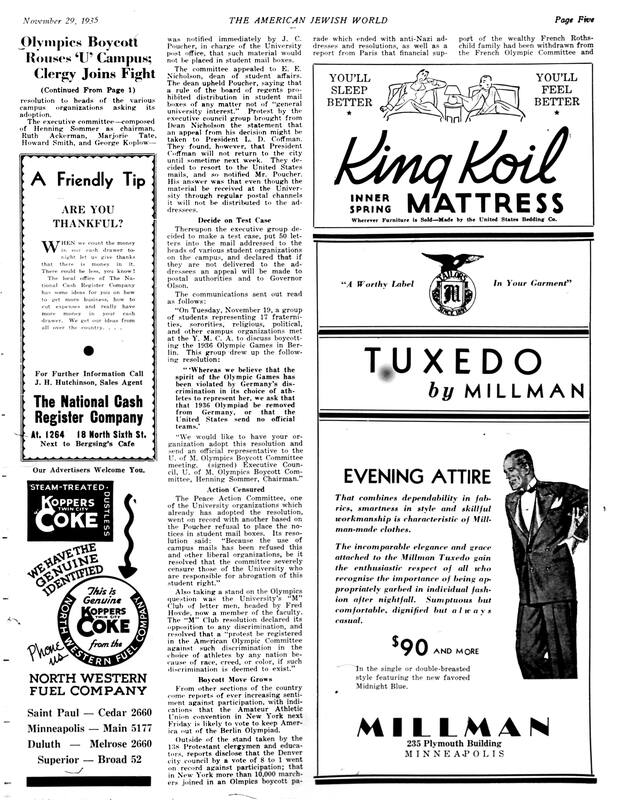 The November 29, 1935 American Jewish World offered the most complete account of activists’ efforts to distribute information about the boycott vote through the University mail system.